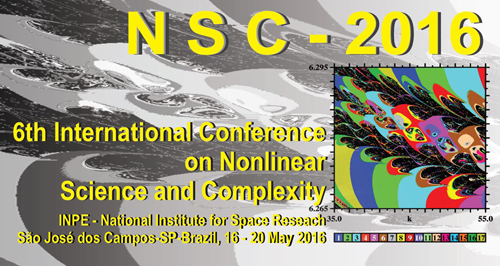 The proceedings of the NSC-2016 can be accessed here. The deadline for manuscript submssion for the journal special issue was now August 31th, 2016". Go tho this link for more informations. Dr. Mark Edelman wins the Zaslavsky Award. Dr. José Roberto Castilho Piqueira wins the Lagrange Award. Final deadlines for submission were defined! For technical reasons, the conference venue has changed. It will take place at INPE, in Sao Jose dos Campos.